Books are one of life’s greatest pleasures. I am not a kindle or computer book reader fan. I suppose it is comming that way and books will be stopped or burnt or something like that. So I will continue to collect as many as I can on the old west. Many are going out of print within a few years of publication. 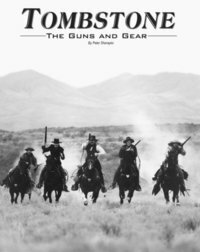 It is rare that one is reprinted and thank goodness “Tombstone – the guns and gear” is one. Originally published in 2004 by Peter Sherayko, it is now back in print in 2010. Who knows how long it will last. Get one today. Peter provided most of the guns and gun leather for this classic western move with Kurt Russell as Waytt Earp and Val Kilmer as Doc Holliday. Chisholm’s Trail has used this book like a bible of correct gun leather for years and has been fortunate enough to develop a friendship with Sherayko. He has often assisted us with the correct patterns for the gun leather from the movie “Tombstone.” See our Western Movie button to purchase gun leather like the movie. The book TGG is available from us for $74.95 “signed by Sherayko”, including shipping and handling. 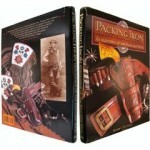 If there is one book you buy, make it “Packing Iron.” This is the ONLY indepth study of American Western cowboy gun leather in existance. The author Richard Rattenbury, is a personal friend and the curator of The National Cowboy Museum, in Oklahoma City. We have visited this museum numerous times and have actually examined many of the holsters in this book. If you would like a holster from this book just contact Chisholm’s Trail Leather and let us know which one. This is a hardcover you should own and we have it for $55 including shipping and handling. This is the most recent book released by Dennis Adler. Dennis is a prolific writter of the American West. He is also a contributor to many books and magazines such as the Harris Publication “Guns of the Old West.” This magazine is available for less than $20 on line and we recommend it highly for both historians and cowboy shooters. Adler is a good friend of ours and we received one of the first copies of this book. It has tremendous coverage of the guns and gun leather that went west and the famous outlaws and lawmen that went with them. Dennis asked us to contribute to the “Billy the Kid” chapter and you can view our gun leather on those pages. Also our famous “Cleaned Up” photo of William Bonney aka Billy the Kid. Often our customers are our best resources. We were contacted by the fellow that currently owns Pat Garrett’s holster and he was nice enough to share photos with us. You will have to buy the book to see it. If you would like any of our Billy the Kid or Pat Garrett gun leather just contact Chisholm’s Trail Leather. This hardcover book is another must for your collection. Available from us for $39.95 including shipping ahd handling.